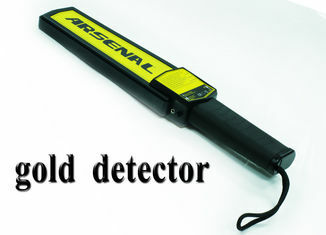 Hand held metal detector wand with audio and vibrating alarm. Make the security check easy. This metal detector wand is user friendly and provides outstanding performance, stability, and extreme sensitivity in detecting very small objects. Versatile configuration: The metal detector is equipped with a straight- belt holster , easy to wear , body protection safety rope, top drop and impact resistance design , one-touch sensitivity adjustment function , plug-in charging port . Unique features: the world's leading ultra-high sensitivity. Can detect dedicated phone "TF Memory Card" and " GSM mobile phone number card " . Security officers will have a tactical advantage when they are scanning and retrieving metallic items. It uses self-calibrating digital microprocessor technology, which needn't periodic sensitivity adjustments. Advanced design concepts : the metal detector is a digital intelligent detector, use the advanced Japanese original Fuji 32CPU central processor as the core circuitry to process digital signal conversion, the use of large-scale integrated circuits , superior performance. Steady process materials: ABS plastic shell is made of high-strength once cast, combat ability, fine craft , 2 m free-fall drop height without damage ; probe surface with ultrasound on combined repression , waterproof , dustproof, light weight , easy to carry and so on. This compact hand-held metal detector is the ultimate tool to detect pistols, knives, razor blades, box cutters and foil wrapped drugs from a close distance. Multiple alarm modes: multi -color high brightness LED lights, audible alarm indication lights , vibrating alarm indication lights , low voltage lights, audible alarm lights blew indicator . Electronics factory, SMT chip factory, cell phone factory, and the electronic components and precision metal parts processing industry.